Preheat the oven to 350 degrees F. Line 24 (2 ½-inch) muffin cups with paper liners: set aside. Spread 1 cup coconut on a baking sheet. Toast for 6-8 minutes or until golden brown. Cool completely on wire rack. In a large mixing bowl, combine cake mix, pudding mix, eggs, coconut milk, oil & yellow food coloring; beat with an electric mixer on low for 30 seconds. Scrape down the side of bowl, Beat on medium for 2 minutes more. Spoon the batter into the prepared muffin cups, filling each about ¾ of the way full. Bake for 15-20 minutes or until a toothpick inserted near centers comes out clean. 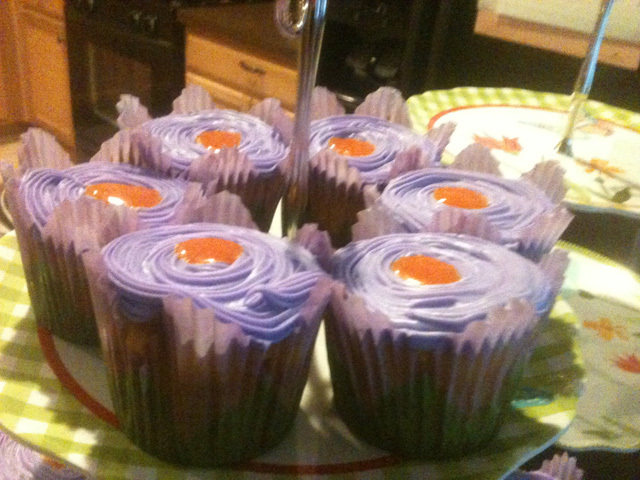 Cool cupcakes in muffin cups on a wire rack for 5 minutes. Remove cupcakes from muffin cups & cool completely on wire rack. In a medium bowl, stir together ½ cup whipped cream frosting & the lemon curd until combined. With a sharp knife, make a ½-inch slit in the top center of each cooled cupcake. Place lemon filling in a disposable piping bag; snip a small end of one corner of the bag, & pipe filling into cupcakes. In a medium bowl, stir the coconut extract into the remaining whipped cream frosting & frost the cupcakes. Toss together the toasted coconut & the remaining ½ cup untoasted coconut. Sprinkle the coconut mixture over the frosted cupcakes. Thanks to you Christine for sharing with us karen's lemon filled coconut cupcakes.Its coco-nutty. Delicious! I've been craving sweets all day. This post isn't helping. They look great though! These are so pretty--I love the lilac frosting! I love the lemon and coconut combination! the cupcakes look gorgeous C! Hi Karen and Christine - what a nice recipe and thank you for sharing! Sometimes the doctored box cakes mixes are the absolute best! YUM, coconut and lemon are so delicious together! They look gorgeous as well :) Have a great day! I love lemon cupcakes and these look so yummy! And I am always looking for new ways to doctor-up cake mixes! What a nice idea to combine lemons and coconut. I bet these cupcakes tastes great! This is so gorgeous, beautiful outcome and love the colors. Lemon and coconut do make for a tasty treat! Lovely colorful presentation also. Well done Karen. These cupcake sounds awesome. Love the addition of coconut. I bet it tastes fabulous. Happy Thanksgiving to you & your family, Christine. Enjoy & have loads of fun. Well aren't they colourful little cakes? They look lovely and I bet they tasted fantastic. Oh yum. These sound great. I love non-traditional cupcakes! I will have to try this out! Oooh sounds really, really good...and they look so pretty! Fabulous job, Karen! Love this combination--they look yummy! Thank you! Have a wonderful Thanksgiving. Enjoy! Thank you to all for the warm comments. You mean the world to me. So pretty! :) Have a great weekend, Christine. Lemon anything tops my list. Add coconut and I'm a happy camper! So pretty! Simply love the lemon curd. Lemon and coconut is such a magical combo! I love anything with coconut so this caught my eye. Looks great.